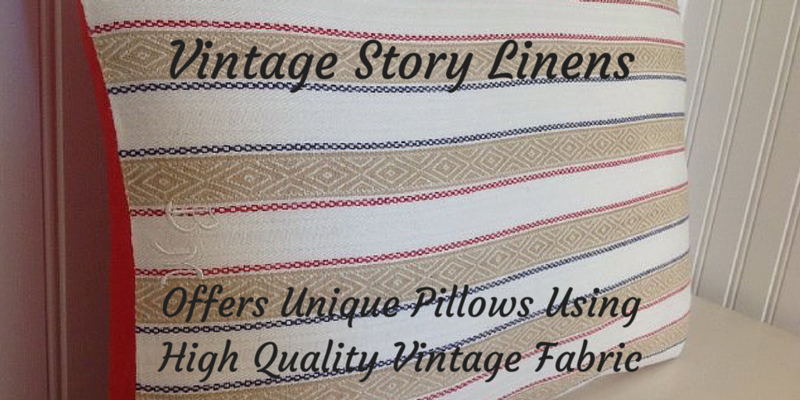 Vintage Story Linens Offers Classic Comfort and Style - Sam Enjoys & Shares! Books, Music, Video, Streaming, Games, Apps, Fun! Vintage Story Linens offers lovely handmade pillows for classic comfort. The pillows are decorated with unique vintage material. I received a pillow to review and a discount code for my readers! On initial inspection, I was impressed with the packaging. The pillow case and filling were both beautifully wrapped. The package included an beautiful information card that provided details about the material and the history. As I assembled the pillow, I noticed it is well constructed with even stitches. The filling is a plush feather and down and fit perfectly within the handmade pillow case. Everything about Vintage Linens is quality, in my experience. The material was also immaculately clean. Several guests have commented on how comfortable the pillow is. Often throw pillows seem more ornamental than cozy. This pillow is both lovely to look at and super cozy. I highly recommend Vintage Linen for those who are looking for n accent pillow for their home or for a special gift idea. Product description from Vintage Story Linens below. Keep in mind each item is unique, so this just gives a peek.. Antique European Linen, Monogrammed Initials, Vintage Horn Buttons, and Custom Down/Feather Insert. Like an antique quilt, a pillow made from vintage textiles has a story to tell. Stunning 1920s Art Deco monogrammed German linen, in pristine vintage condition, graces the front of this plump custom made bolster pillow. Absolutely beautiful fine texture! Stripe colors include goldish oatmeal, navy blue, Christmas red, and cream. The initials, BM, are monogrammed on the edge of one side. Monogrammed linens denoted ownership, status, and adds decoration. Antique monogram linen is rooted in the patterns and culture of everyday life over several centuries. The lovely tradition of gathering a trousseau often began shortly at a female child’s birth and continued until her wedding day. Monogrammed pieces initially only represented the bride’s initials as the groom might not have been known. As that information became apparent, the grooms initial(s) were added. On the back of this German linen bolster is a vintage red linen fabric. The color nicely match the colors on pillow front. Large antique horn buttons secure the plump down/feather pillow insert. Prior to the colonial period, natural horn buttons were slices of antler. Processed horn buttons were patented in 1830. The hollow portion of the antler was soaked, straighted, and became so plastic that blanks could be stamped or molded. The buttons are often dyed dark brown or black. Our buttons, on the deliciously plump pillow, are dark brown. Vintage Story Linens specialize in Designer Art Pillows made from upcycled antique and vintage European and American textiles (fabric, lace, hand woven, needlepoint, ticking, etc.). Our pillows are custom artistic designs. Many with mixed vintage textiles, which is a trend seen in Europe lately. Handmade laces, hand needlework, and hand woven fabrics are vintage treasures and many are heirloom quality! 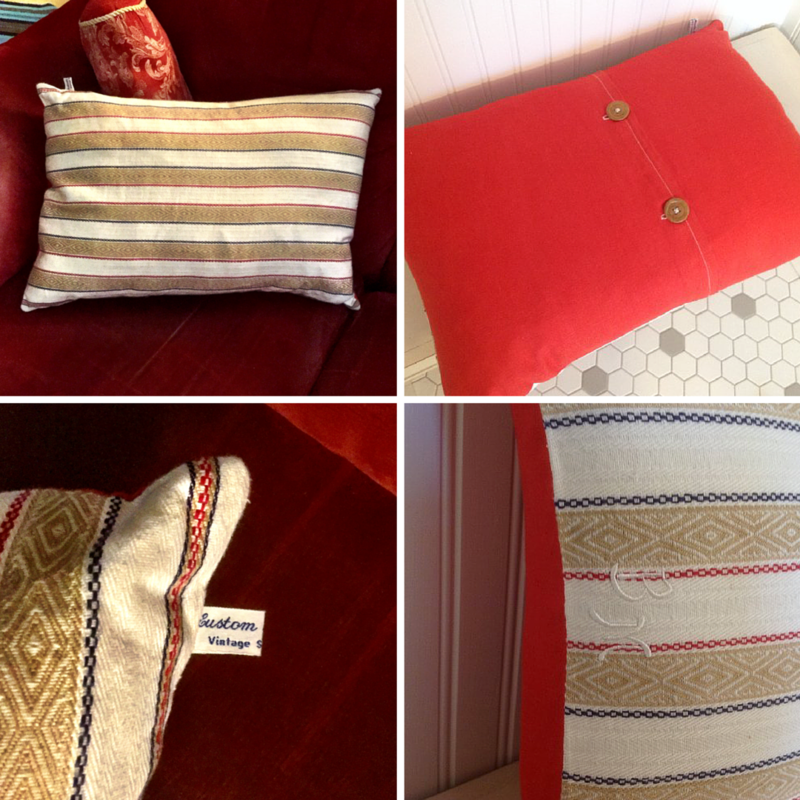 They are worth saving, repurposing, and showcasing on beautiful pillows. Behind every pillow, our shop makes, is a fascinating story of the textiles used to create it. I’m an award winning quilt maker and love the captivating stories behind the vintage quilts and their maker. I believe buyers will love the stories behind their custom one-of-a-kind pillows also. In addition to our stunning antique and vintage textiles, we believe in using high quality, organic products: Down/feather pillow inserts, 100% cotton thread, and 100% linen or cotton/linen blend fabric. We use charming vintage/antique buttons on the pillow back to secure the custom down/feather insert. Most are either gorgeous 1930s glass buttons or lovely mother-of-pearl buttons. Vintage Story Linens is available on Amazon Handmade (affiliate link) and on Etsy. Great News! Vintage Story Linens is offering a discount for my readers! If you purchase a pillow through their Amazon Handmade Shop you may receive a 15% discount. The coupon code on Amazon is “AMAZOZ15.” It expires 6/1/16!